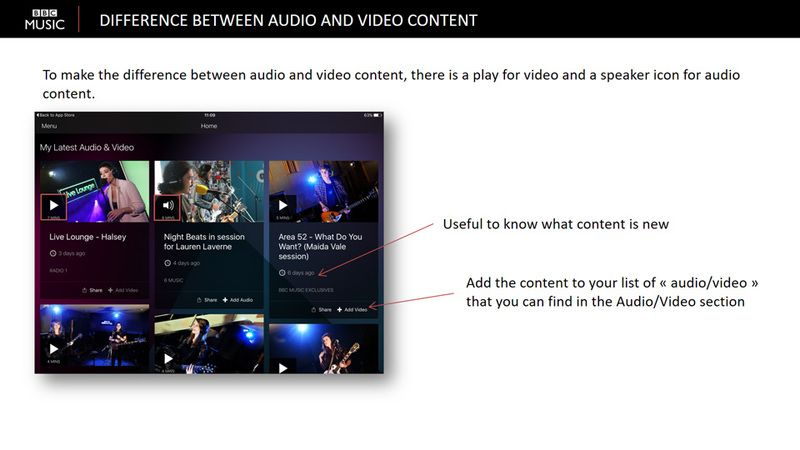 Watchmusic is a premium service which offers music centered videos, whether it be video clips, concerts or interviews. Originally, we could reach the service from two different ways: either with the Watchmusic stand alone website and application or with the Watchever service (check here) which offered a music category that was in fact equivalent to Watchmusic. 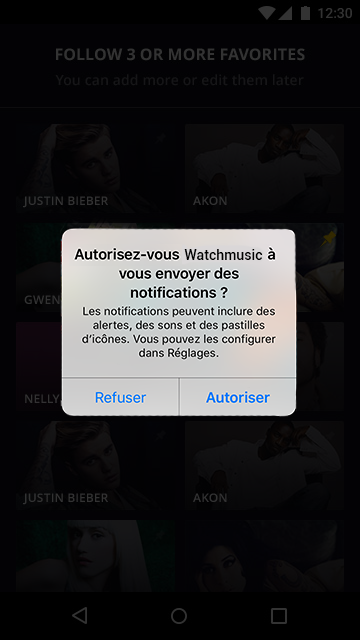 service Watchever (check here) qui proposait une catégorie musique qui correspondait en fait à Watchmusic. 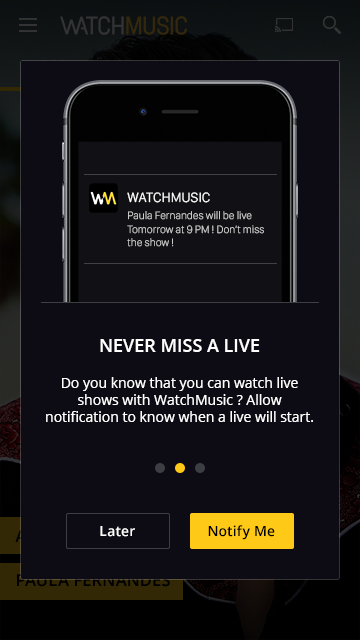 However this last service had been closed because the company wanted to focus its activities on Watchmusic only. 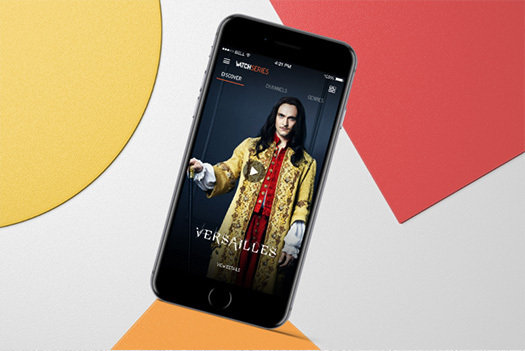 When I arrived at Watchever, the company that was in charge of Watchmusic, the stand alone application already existed but with the Watchever closing time, it was necessary to improve some of its aspects and also create new features. 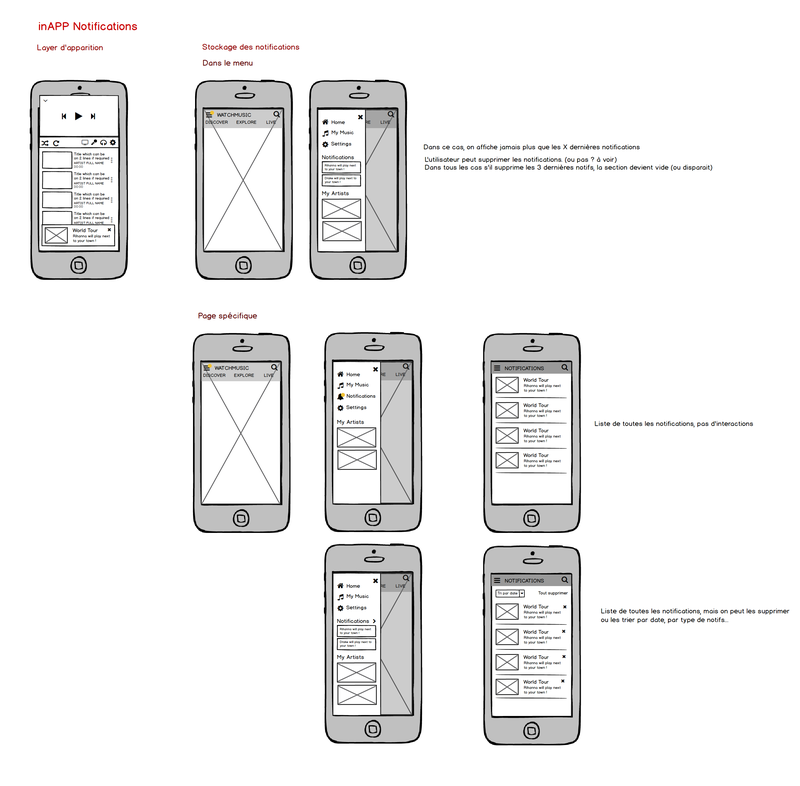 I mostly worked on the application which was a central element of the project. 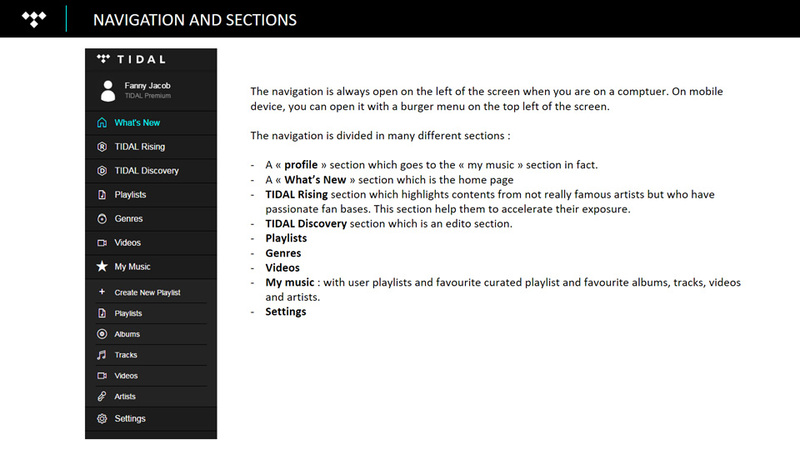 I especially worked on some features like the lyrics, the notifications or all the interaction and animation part. 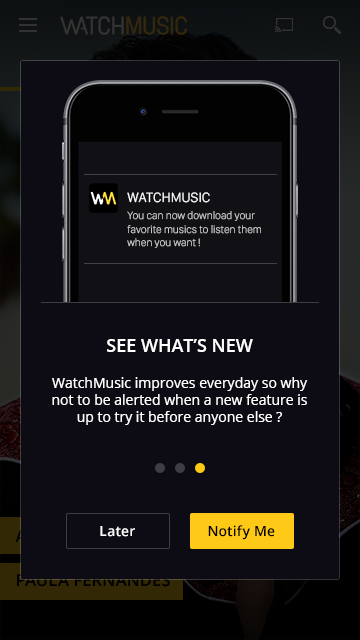 Watchmusic is a premium service. 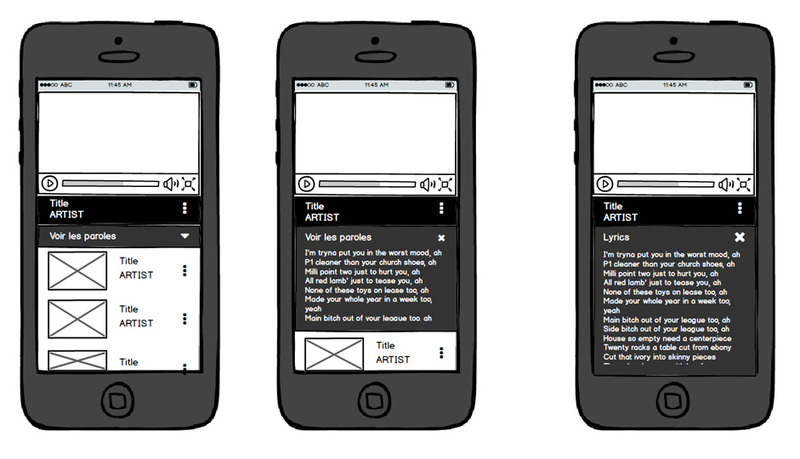 So the application needed to be particulary neat regarding the visuals and the experience. We needed to clearly distinct where we just need to improve the existing service and where we need to add new things or remove completly others. To improve our service, we needed to be really attentive at the market and watch out every competitors, new or not. 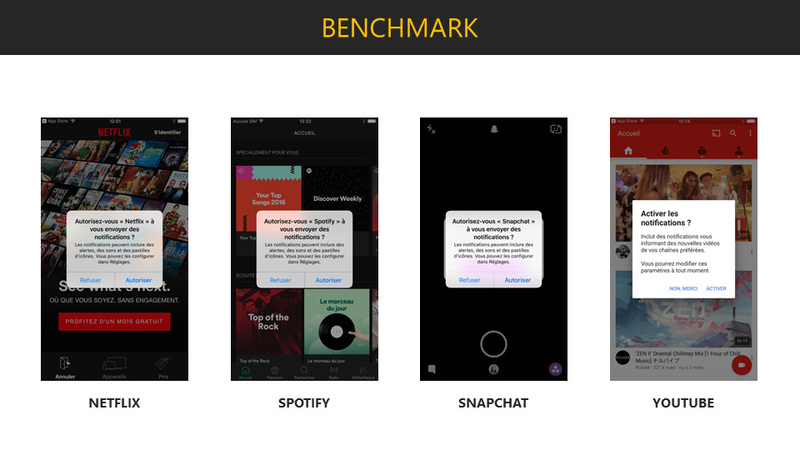 So I did a lot of benchmarks about music application competitors. 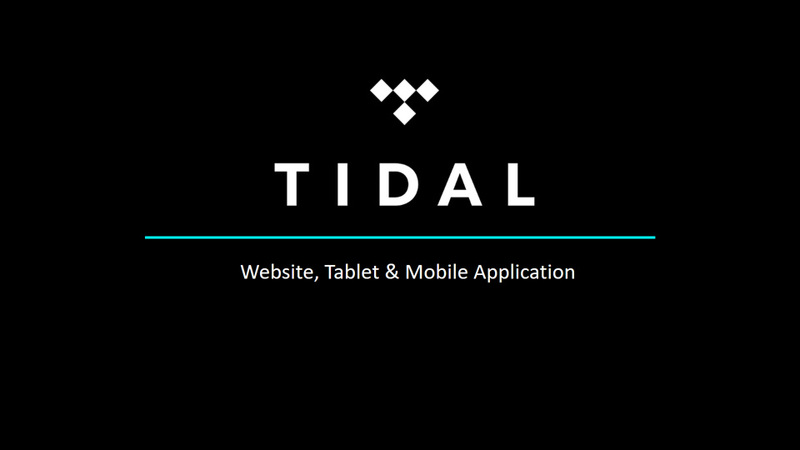 One of the services I studied was Tidal. 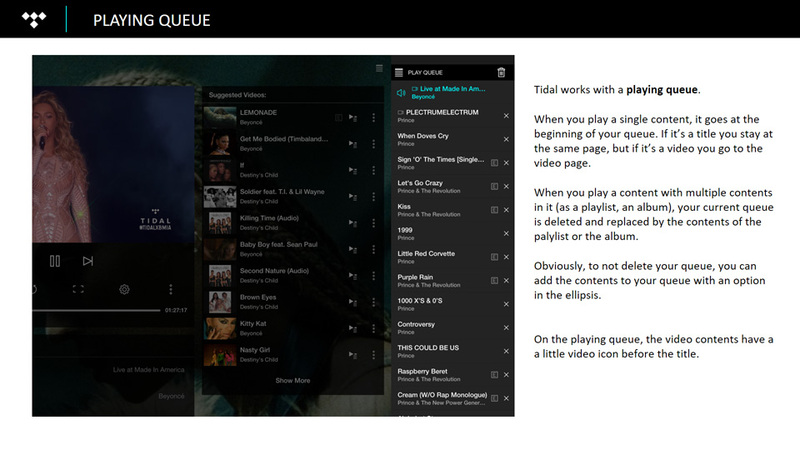 Tidal is a subscription-based music streaming service that combines lossless audio and high definition music videos with curated editorial. 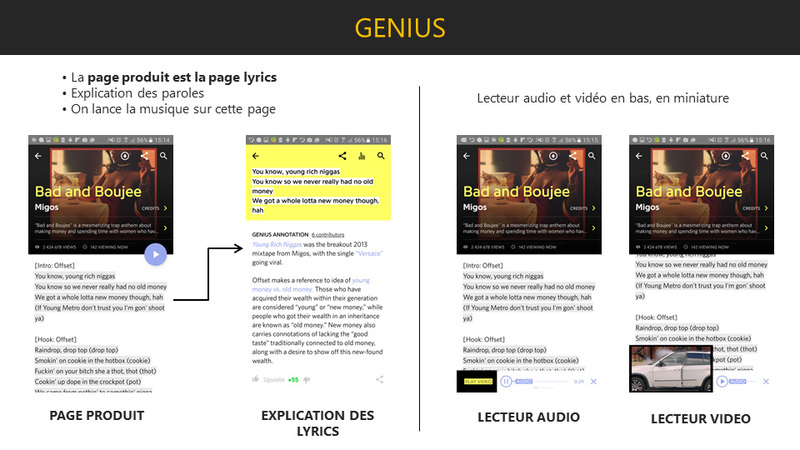 It was created in 2014 and relauched in March 2015 by Jay Z. One of the reasons why we were interessed in this competitor was it's a premium service. 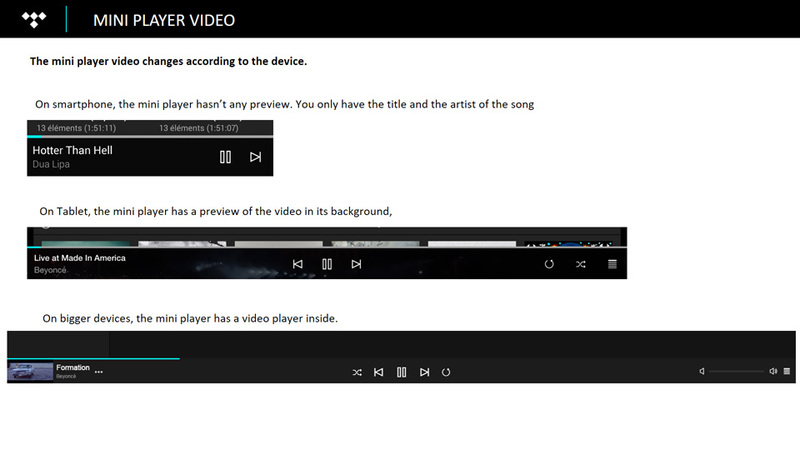 So during the benchmark, I pay attention to the premium aspect (the princing, the different subscriptions), but also and obviously all the functionnalities of the application, what the user can do or cannot. 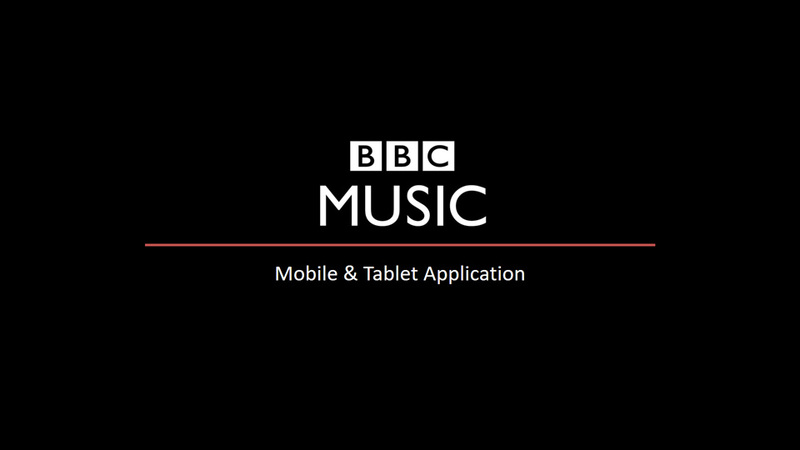 BBC launched its application BBC Music at the beginning of March 2016. 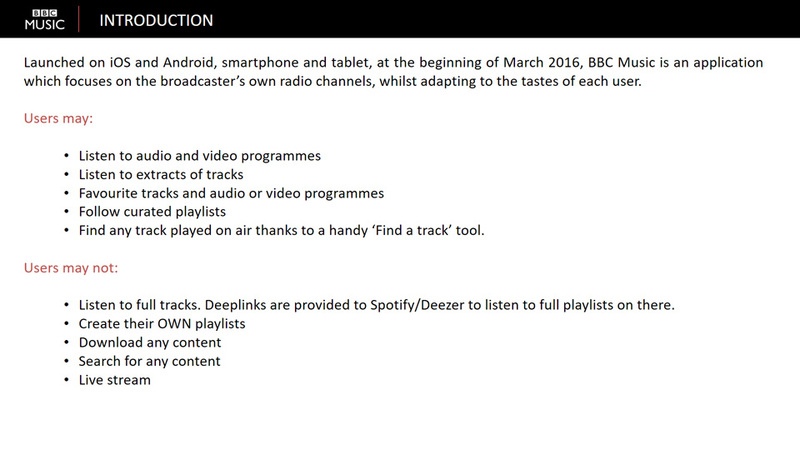 BBC Music is an application which focuses on the broadcaster’s own radio channels, whilst adapting to the tastes of each user. 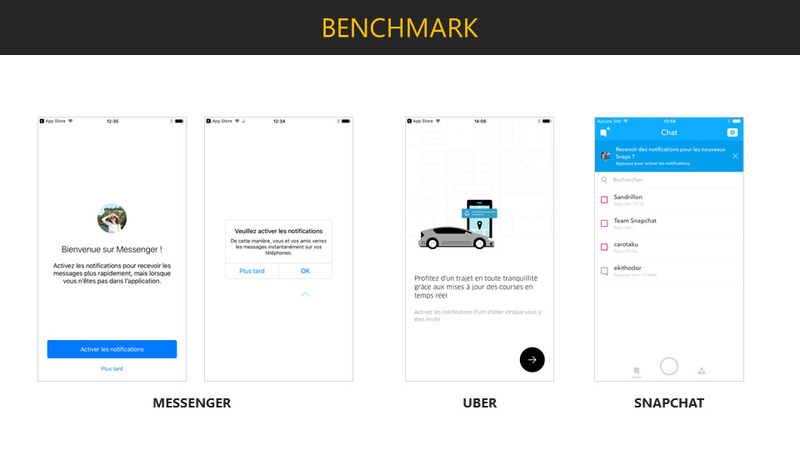 As a new service in the market, it was obvious to benchmarked it. 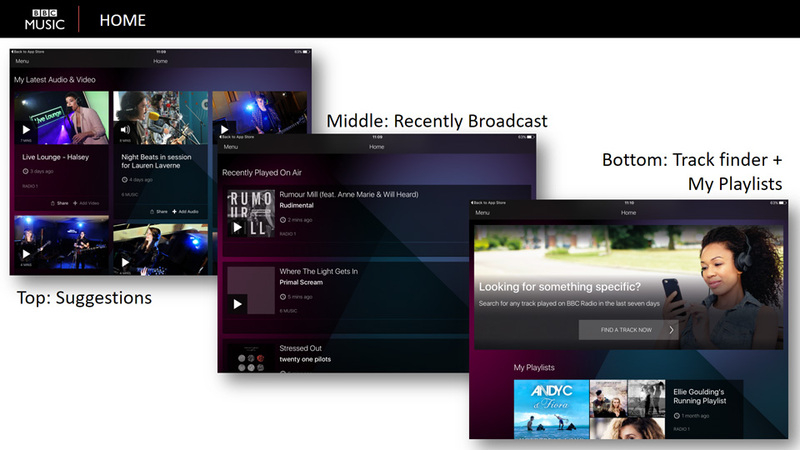 Moreover the application focus on the radio aspect of it, something pretty unusual, so it was even more enriching to analyze. 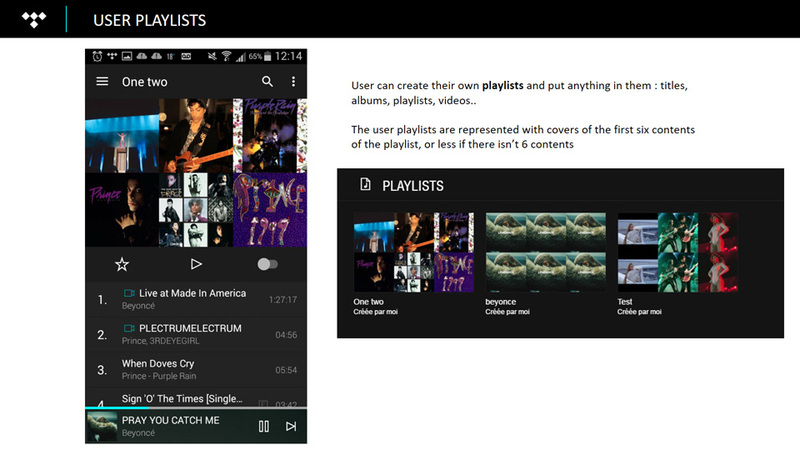 Watchmusic wasn’t a full new application, it already existed a first version. So we had the opportunity to run some advanced usertesings. Alas like the application was out only in Brazil, we coudn't really do some tests with real users. But we made some usertesings with 4 new propects to have their first feebacks and to analyze their overall comprehension of the application. 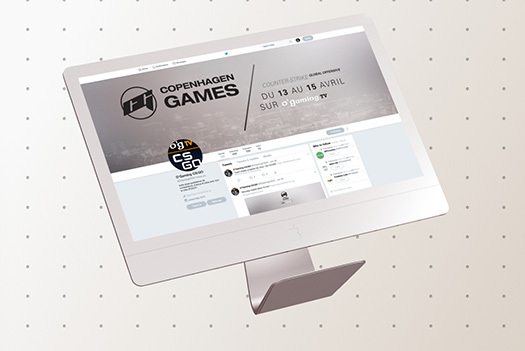 There were pretty long and detailed usertesings so with the results we could target some problems on the application or some really good points. It was a really interesting experience, because it was my first real usertesings and I really liked to do them ! At the end of the usertesings, we analyze obviously everything and I made some videos to sum up the raising issues during the tests. 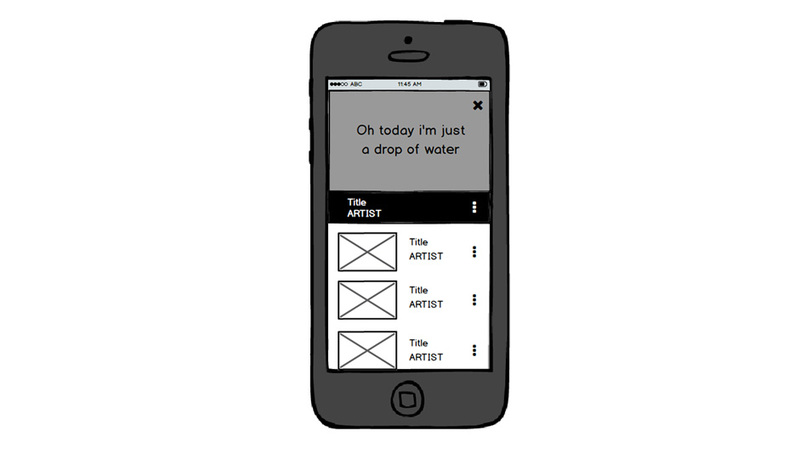 During this project, I made a lot of animations and the first thing I was focused on was the animation of the home page. The home page was quite a big deal, because we didn’t know exactly what we wanted to do for a while. In this project I was just making the animation and sometimes suggesting some visuals. 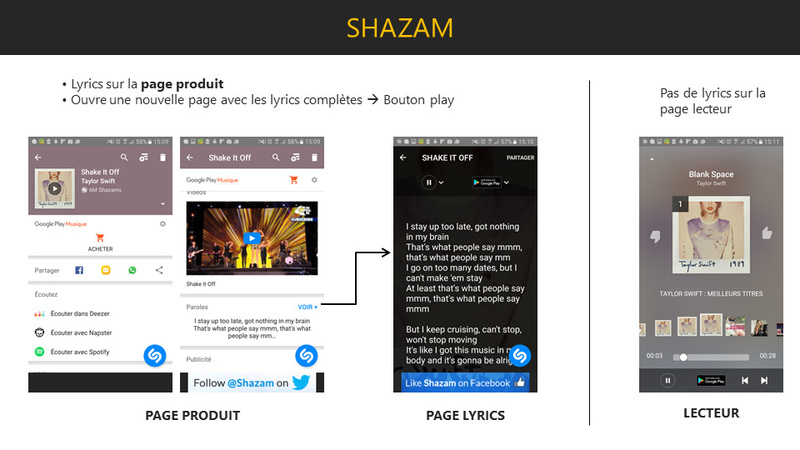 So you can see below the different propositions we made from the very beginning until the final version ! It was quite an evolution ! First we started with the idea of cards. So first we began with really simple card elements that pile up. 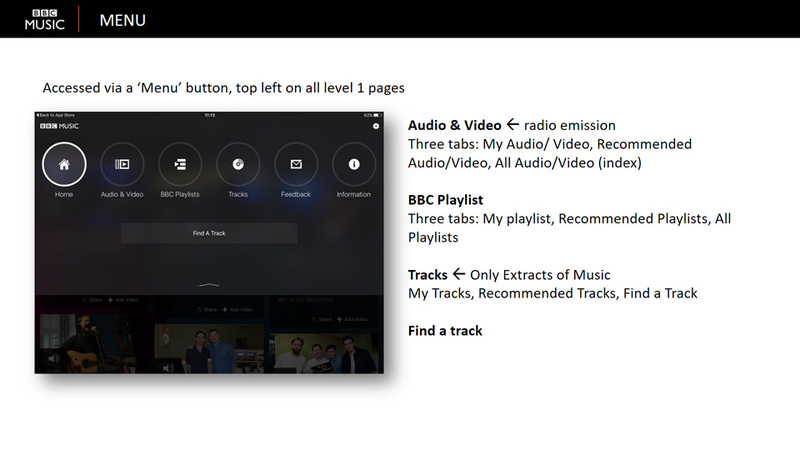 But finally, we moved to what we had in the Watchever application, so a big full screen thumbnail to give a better immersion by using beautiful visuals. 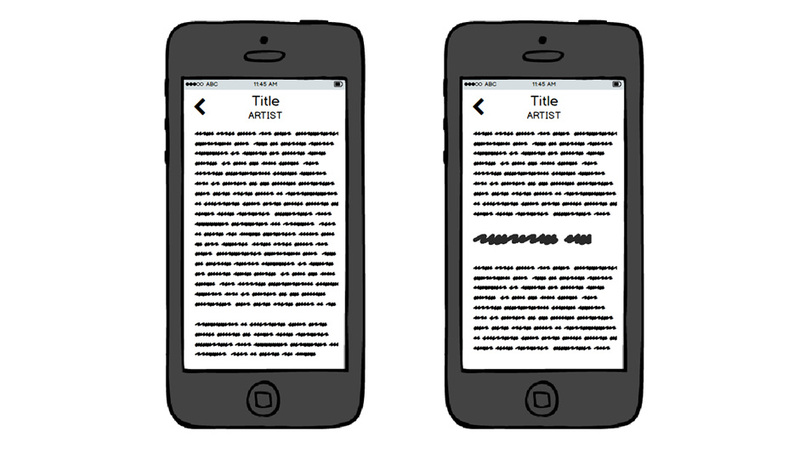 When it came to notifications, we worked on two different kinds of them. First the notifications inside the application itself. There were two main problems to solve. 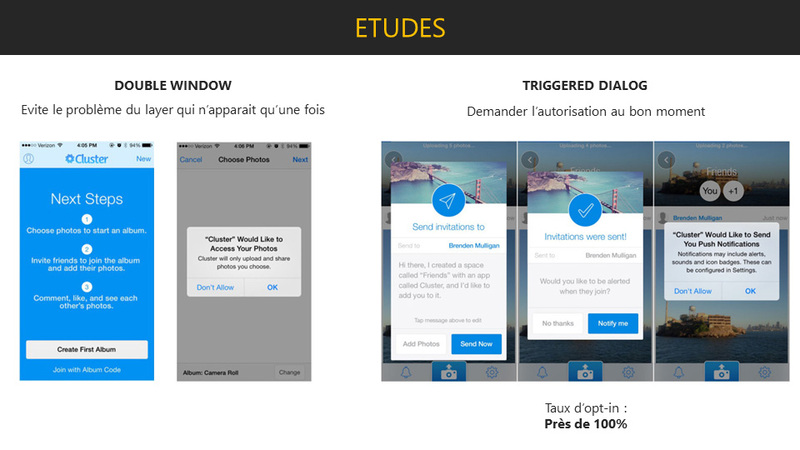 Where and how the notification will appears : “How I’m alarted when something happened while I’m using the app ?”. And where the notifications will be stocked: "Where can I find my previous notifications ?" The second kind of notifications was the Push notification, the one you have when your app is closed. The problem with those is that to sent them to the user, the user needs to accept notifications first (on apple device at least). So I made some reasearch about the existing studies on the subject. I add to these researched a benchmark showing the common uses of those notifications. Finally, I propose two solutions for this problem. The first solution I recommended was the arrival of a double layer at the right time, namely when a user just followed something. 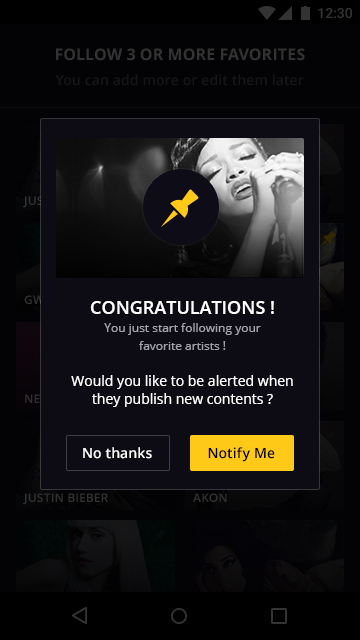 It's probably the moment where the user is the most encline to accept the notifications to receive news from his previous subscription. 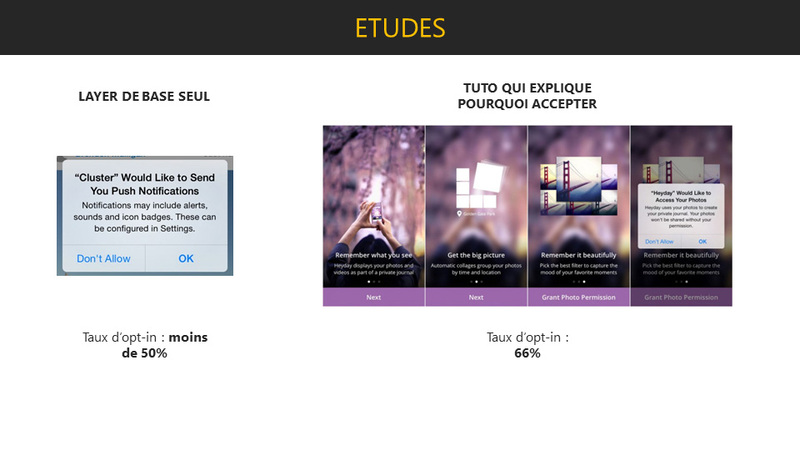 However, I propose a second solution that explain the benefits of the notifications through a short tutorial. 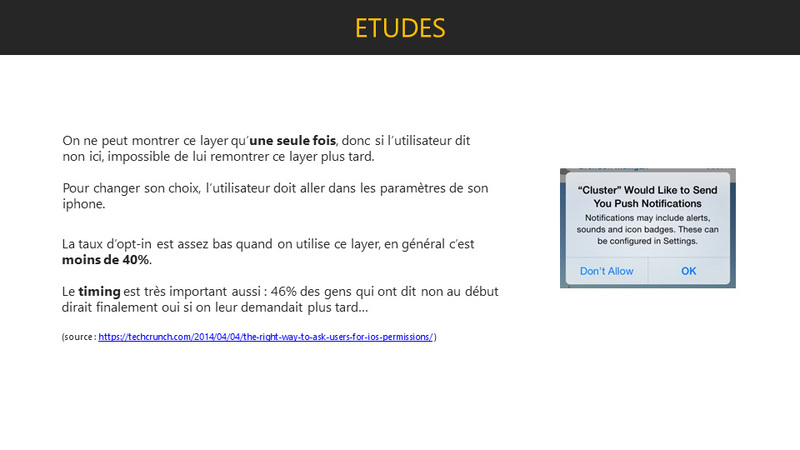 The first thing I do was a benchmark about the other applications that propose some lyrics or karaoke features. After that, I propose different solutions for our service. 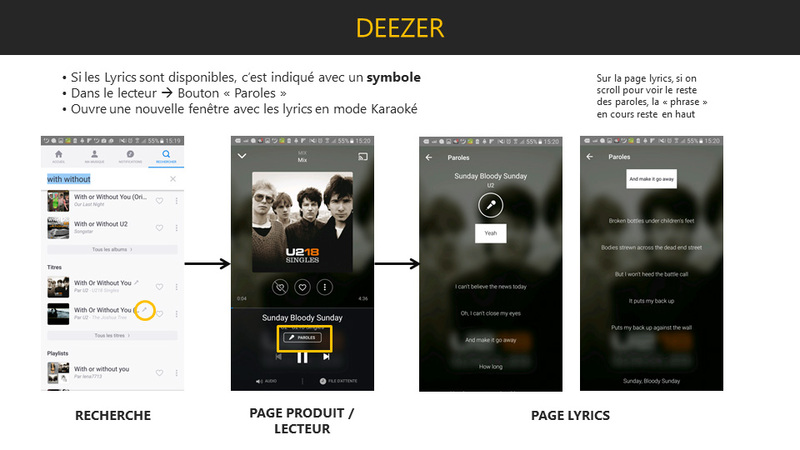 One of the main point was that we weren’t sure if we wanted just a lyrics feature or a full karaoke experience. So I made different propositions to answer the two different perspectives based on my previous researches. 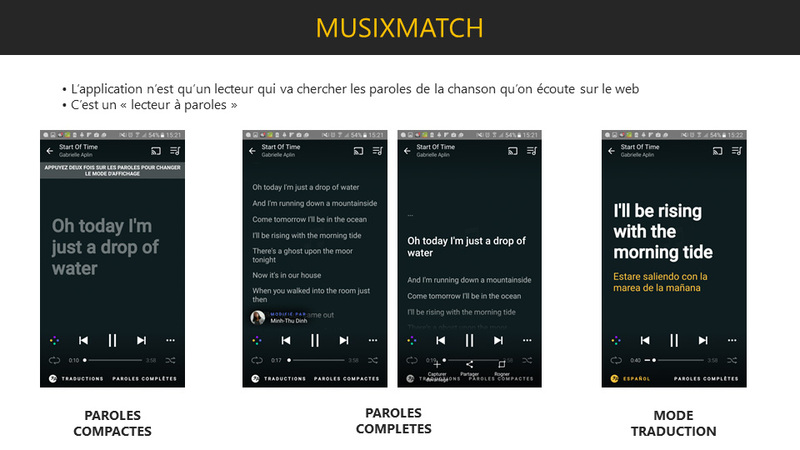 Finally we decided to have a karaoke experience, easily activable and dismissable, where you also can navigate in the lyrics without following the song and come back to where you were with just one click to resume your karaoke. 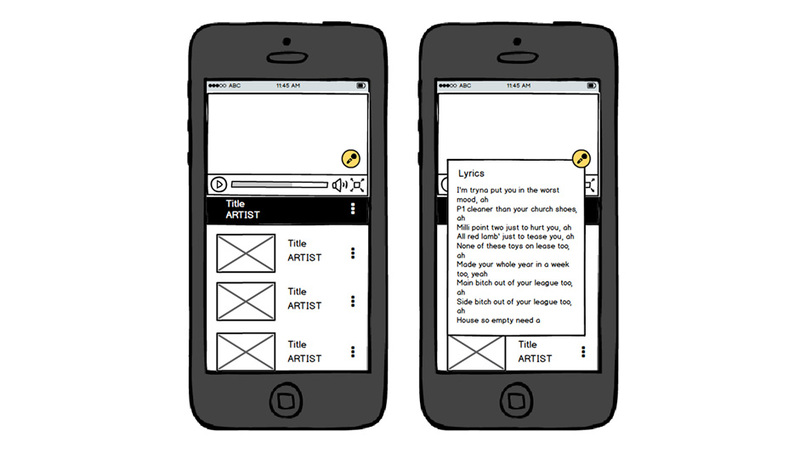 One of my main activities for Watchmusic was to work on all the interactions and the animations in the application. It was sometimes just tests to try different things and on other occasions it was for the real stuff we wanted to implement. You already have seen some of them at the begining with the home, but here there are some more animations. 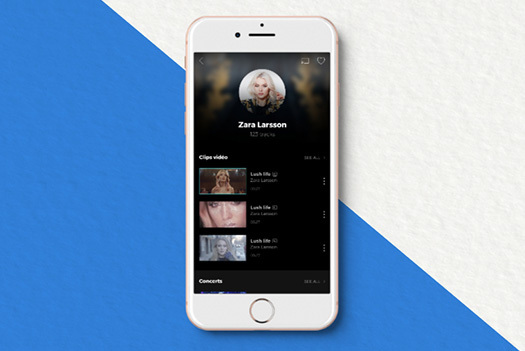 Thanks to Watchmusic I could lead the development of many features through all the creative process: researches, benchmarks, wireframes, mockups and even animations... I also had the opportunity to participate to some usertestings. But most importantly I could work on interactions and animations that became a part of my daily work that I particullary love. At the end of this project, we explored other trails, like virtual reality for concert events for example. 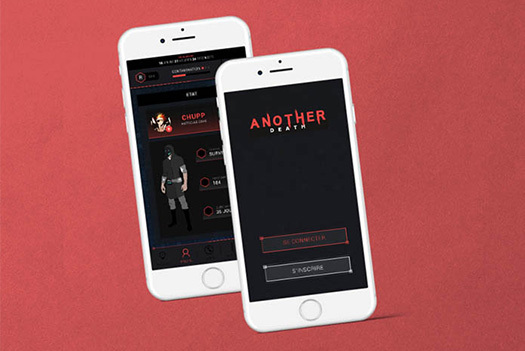 But at this moment, the company merged with an other one and finally the Watchmusic application and project ended.